What Is DA Form 67-10-1? The DA Form 67-10-1 also known as the Company Grade Plate (O1-O3; WO1-CW2) Officer Evaluation Report is a document used for providing the Department of Army Headquarters (HQDA) with useful and valuable information about a rated officers' competence and potential for promotion. The DA 67-10-1 is used for the assessment of first and second lieutenants, captains, warrant officers WO1 and chief warrant officers CW2. 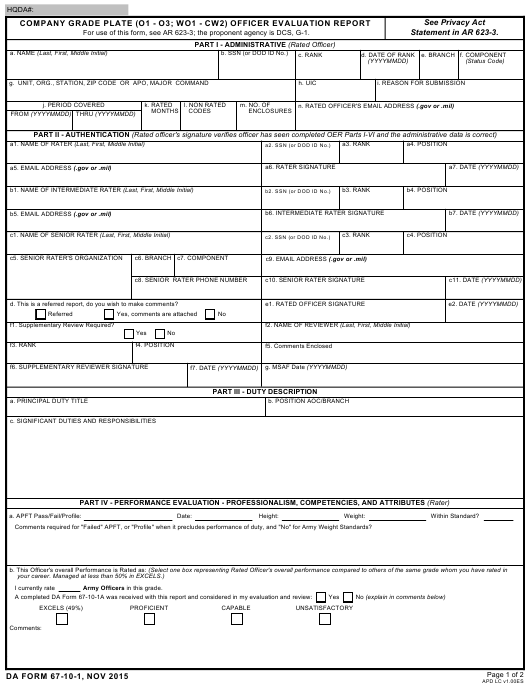 This edition of the form released by the Department of Army (DA) in November 2015 and is valid and in use today. An up-to-date fillable version of the DA 67-10-1 is available for download below. The form - sometimes referred to as the DA Form 67 for short - should not be confused with the DD Form 67, Form Processing Action Request. This form is used to cancel an existing Department of Defense form, to make changes to an existing form or to add a new one to the DoD inventory. Army Officers in this grade. Part I is for entering the required administrative data and providing the rated officer's personal information, unit data, number of rated months and the reason for submission of the report. Part II, Authentication is for authentication by the rated officer and rating officials at the end of the rating period. The rated officer must sign the report after authentication by the rating officials. All signatures must be on the form 14 days prior to its THRU date. Part III describes the duties of the rated officer. The officials in charge of the rating process are responsible for ensuring that that description is complete, factual and correct. Part IV includes an assessment of a rated officer's core leader competencies, overall performance, and adherence to Army values. Part V of the CGP-OER is completed if and when an intermediate rater participates in the rating process. Part VI provides the senior rater's assessment potential of the rated officer. The CGP-OER cannot be forwarded to the Department of the Army Headquarters until the THRU date listed on the DA 67-10-1. The DA Form 67-10-1A or the Officer Evaluation Report Support Form is assisting the rating chain in preparing the report by the rated officers self-evaluation. This form has six criteria: character, presence, intellect, leads, develops, achieves plus a self-development goals field, filled by the rater. The rated officer fills it at the beginning of the rating period and submits at the beginning of face-to-face discussions. The DA Form 67-10-2 or the Field Grade Plate (O4-O5; CW3-CW5) Officer Evaluation Report is a report form, analogous to DA 67-10-1, but used when evaluating officers ranked major, lieutenant colonel, and chief warrant officers from three to five. The DA Form 67-10-3 or the Strategic Grade Plate (O6) Officer Evaluation Report is also a report form but used when evaluating colonels. Everything stated above also refers to this form. The DA Form 67-10-4 or the Strategic Grade Plate (O7) General Officer Report is a report used to evaluate a Brigadier General - "General" for short - or higher. The U.S. Army changed their officer evaluation reporting system to a new format on April 1, 2014. The DA Form 67-10-1 - otherwise known as the CGP-OER - and other forms in the DA 67-10 series replaced the DA 67-9 Form, which was a universal evaluation form for officers of all ranks. The new reporting forms were diversified to analyze and rate officer performances in a manner more in line with Army doctrine. The officer evaluation report is prepared by the rating chain, which includes a rater, a senior rater, and sometimes an intermediate rater. The process includes supervision, writing a self-assessment, a performance assessment conducted by the raters over a period of time and a face-to-face interview. The completed DA 67-10-1 is forwarded to the HQDA. The rated officer must file a supporting DA 67-10-1A Form during the preparation of the report. It includes a description of duties and a self-assessment in six parts. This form is no forwarded to the HQDA since it is used only as a medium for the preparation of the actual report.